We remember our first sip of hoppy beer, do you? Nearly spit that $#!^ out. Now we fantasize about this stuff. Thinking about those hop ones...bursting with juice...ripe as all hell...makes you look forward to that first RESIN® all day long. Can't wait. Key Ingredients Chinook and Centennial Hops are a little old school, with tons of resin and pine notes. RESIN uses a ton of different hops, for a massively complex hop bouquet. Poured from a 12oz can (Best Before Date of July 15, 2015)...the freshest batch I have had to date. 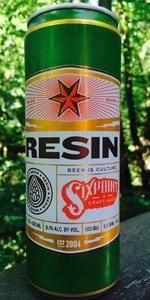 Sixpoint Resin is one of the best IPAs available here in Houston. Resin consistency not over bearing, hoppy up front, bitter notes at the back w/ an apricot base feel. So well rounded. Better bought fresh, recommend keeping in the pantry unless ready to drink...then fridge or ice cool and drink immediately. "Best before July 13, 2014" on this can. Still tastes fresh. A - 4 - Pours a quite clear, golden-honey-orange color. With a heavy handed pour, forms about a two-finger head of slightly off white colored, dense, thick head. Medium/high head potential, medium/low head retention. Thick, whispy lacing. S - 4.25 - Smells of pine, citrus, grapefruit, bitter grapefruit rind and slightly dank hops. No sweet fruit smells to be found, which I'm thankful for on this particular brew. T - 4.75 - Light, neutral sweetness upfront, isn't really any particular type of sweetness, but just a beery beer sweetness which quickly fades into medium bitter hops, grapefruit rind and pine. F - 4.75 - Nice oily texture, medium thick mouthfeel. O - 4.5 - This is an extremely good representation of the double IPA style. I wish more IPAs would follow along these more savory and bitter guidelines of Resin. There is however, one tiny little thing missing that I'm wanting. A slightly sour, tart flavor would complement nicely in this beer, perhaps adding lemondrop hops? That would push this to a perfect 5 for me in a heartbeat. Nonetheless, an absolutely excellent and stellar double IPA! I scored a four pack on a visit to Ohio. It pours a beautiful clear gold, with a nice high white head. The smell of pine, cirtus and pineapple hits your nose as soon as the can opens. The flavors carry over from the scents, with a sweetness on the front end and a slight bitterness on the back. For a beer that shows off it's 9.1 ABV and 103 IBU, this one is smooth and very drinakable. I should have nabbed a case! Canned beer served in a pint glass. Thick, foamy head which is long lasting. Off-white in colour. Leaves plenty of lacing. Cloudy, honey colour with suspended particles. Slow rising, small bubbles. Sweet, fruity, hops, pine, apricot, peaches. The aromas are strong and hit you in the face on opening. Bitter hops, grapefruit, dried apricots, mandarin, mint, and some caramel sweetness. Plenty of bitterness and being high IBU, the alcohol notes are present. Slight prickly pop rocks fizz. Thick, creamy body, not much froth. Strong aromas and lots of flavour. A thoroughly enjoying beer, and despite it's bitterness, it's refreshing and goes down easily. Plenty about it to enjoy and lots of complexity to enjoy on every sip. Hoppy and in IPA territory, but with more malty sweetness than usual. Purchased from the packey best by 05092015. A: cloudy yellow with a thin ring of bubbles, that lacing hangs around forever. S: Middle roasted malts, spicy resinous pine needles with bitter citrus. Mild peppery yeast and everything just blends well. Very well presented IPA notes. T: Follows nose. The mild weediness, pine and citrus peek up and stay up. bitter-orangy-grapefruity finish. M: Semi-creamy, coating well with a smooth, velvety finish. Some signficant bitter notes poke up and subside in the dry, creamy finish. It is a HUGE finish on the dry and bitter side. O: Give me more of THIS. Between citrus, bitter, dry, and pine....this is a balance on the edge of too much. But it is not. Dankness for days! The malt backbone sufficiently props this one up to handle all of those hops that they jammed in here! Surprisingly drinkable (can't really call it sessionable) although it drinks like a much lower ABV brew. Just had this one with dinner in my Dogfish snifter. The clear copper and voluptuous off-white head were a fantastic surprise upon pouring this 12oz can. The nose is full of all the things I look for in hop heavy beers, from spices to grapefruit to (most important) pine. The taste follows suit, but with a considerable malt backing, with great bread and caramel flavors. Overall, this 103 IBU beer is quite balanced, and I'm a big fan. I liked other Sixpoint offerings, but this one blew me away. A: Very nice. Clear orange-amber with a sufficient head. Leaves a lot of lacing on the glass as well, indicating good protein content. S: Boatload of pine and grapefruit; like a traditional WC IPA. Smells exactly like Sierra Nevada's Hoptimum, which is one of my favorite beers. Some of the other reviewers are noting additional tropical scents; I don't detect these, but this might be because the beer is about 4 months old. The smell is still great, however, which is a tribute to the beer's longevity. T: Very solid beer. Actually, quite good. Pine and grapefruit backed up with caramel malt. I also detect sweet honey. The beer is very well-balanced between hops and malt. Great hops with a cloying, honeyed sweetness. It remind me so much of SN's Hoptimum, one of my favorite beers which has sadly been retired. I'll probably start drinking this one more. F: Perfect. Full-bodied but smooth. Glides down the tongue. O: A great DIPA - like a true WC DIPA. Shane was right; they've improved dramatically. That this beer only gets a "good" rating here is a crime against humanity ranking up there with waterboarding and wes anderson's movies. I'm not sure how it gets tagged as an IPA, because it transcends the genre and becomes something else entirely as you drink it. the color, taste, mouthfeel, and lacing are top-shelf and you really sit there shaking your head trying to figure out why it's so different and good. beer advocate feels like an IPA cult at times and anything that isn't a down-the-middle IPA (Stone, e.g., which is the perfect poster boy for the perfect IPA) gets pushed to the side by the rankers. glad the brothers see this one for what it is, even if the sweating masses don't quite get it. Once again Sixpoint hits a home run, finding beer distributors through their app and then getting the logs ordered was lengthy to initially establish but brewery response has been terrific. Great imperial IPA, smooth and crisp, I have it up against a 90 minute DogFish Head and it is neck and neck, complete hops profile difference and great to have both actually. Used to live down the street from Sixpoint Brewery in Red Hook. I'm in California now, not exactly a beer desert, but I do miss these guys. About the most delicious beer I've ever had. Smells like fresh hops. Of course it tastes super hoppy but it's balanced by its nice maltiness. Pretty much perfect...except I can't get it in California! Very smooth IPA covers the ABV well. Had out of the can at BIg and Littles in Chicago. Goes great with the pork belly taco's. A: Pours a beautiful deep gold color with a dense, sticky, 3 finger head of white foam. After a few minutes the head fades to a nice crown that stays around for the whole beer, leaving behind heavy lacing in the process. S: Clean, fresh aromas of floral and piney hops are the first thing that immediately hit you. You also get some maltiness, specifically bready malts with toasted caramel occasionally coming out. There is a little bit of citrus hop aromas as well, but they are dwarfed by the floral and piney hops. T: Crisp, resinous flavors of floral and citrus hops with a good amount of pine. The flavor is obviously hop forward, but there is a good amount of malt suprisngly leading to only moderate bitterness. The malt character is a bit nutty, almost toasty, with a hint of caramel. There is a good amount of malt used, but it plays second fiddle to the massive hop flavors. M: This beer has a medium body and a moderate amount of carbonation. It has a crisp, refreshing mouthfeel that isn't as bitter as you would expect for 103 IBUs. O: Resin is a great beer with excellent hop notes and good balance for a double IPA. It is very crisp and refreshing and surprisingly only has a moderate amount of bitterness. I will be drinking this again without a doubt. this is a winner in my book. Poured from a 12oz tall can into shaker pint glass. Appearance is pale orange with a 1/4 " of white foam that dissipates slowly with moderate lacing. Bubbles rising throughout the glass. Nose offers hints of pine and grapefruit hoppiness. Mouthfeel is true to its name. Flavor starts with a slight biscuity malt backbone then Resin takes over and coats the palate with pine flavor mixing into and finishing with grapefruit.Leaves the mouth feeling coated and almost anesthetized but also savoring the taste and wanting more. Hardly notice the alcohol in the taste and at 9.1% abv this ones a shitkicker to be reckoned with for sure. Just like their cream ale, sweet action, mouthfeel is key here. Not as hoppy as I would expect with a name like Resin. However my palate could be misplaced by the previous IPA. Overall an excellent beer. I'm ecstatic to try other brews from them. Very boozy and, I'll keep it in mind, next time I plan on getting arrested. Seriously though, behind all of it is some underlying notes of peach skin and delicious red apples. This might not be for everyone given the aggressive nature, but there's a lot more to pull than alcohol, grapefruit and malt. This is super fresh, and I dig it. Can youuuuuuuu dig it? Another excellent IPA that completely belies its IBU of 100. It tastes more like 50! So well balanced and a fabulous kick at 9.1 ABV. Greatest beer ever? I say yes. As a major IPA fan, this is the most perfect one I've found for my taste. L: Golden coppery color with a tall head. Clear. S: Fruit and citrus up front; smells like tropical fruit and Grapefruit. Very earthy and malty at the end. Kind of astringent. T: Big Grapefruit to start. Not as tropical fruity as the smell would indicate. Mild mango notes after the citrus. Lots of caramel malts. End with pine and bark. Very crisp and clean! F: Not as resiny viscous in my mouth as I'd have expected from the hype. Smooth and light. O: Solid DIPA. Clean and balanced. Shows off the beauty of the hop without overshadowing the rest of the ingredients. Beautiful brew that packs a punch! Not a huge hophead, but this definitely ranks in my top 5 IPAs.